Once again, I am amazed at the products that I am privileged to review as a member of the TOS Homeschool Crew. Assessment and LEarning in Knowledge Spaces is a Web-based, artificially intelligent assessment and learning system that uses adaptive questioning to quickly and accurately determine exactly what a student knows and doesn’t know in a course. ALEKS offers truly individualized instruction that meets the student at her learning level and instructs her on the exact topics that she is most ready to learn. As a result, no two students will experience the same learning path while working in ALEKS. Learn more by watching a quick 2-minute video. I was very impressed with the assessment that each child was given. It was a very accurate portrayal of what they already had mastered in each subject. I was pleasantly surprised at how much of Grade 3 math my youngest had already mastered so early in the school year. I also enjoyed how the curriculum gave them surprise assessments, prompted review questions, and gave instantaneous feedback to them. 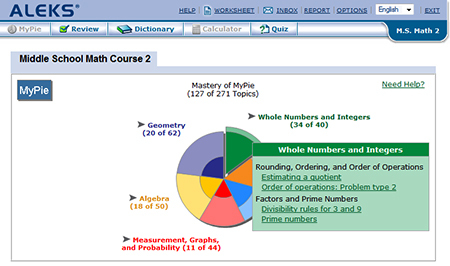 The quiz feature is great, and very easy for parents to use, and assign. The progress reports are easy to read and understand and print out for your personal record keeping. I think one of my favorite features was being able to create worksheets for your child to use away from the computer. If you are traveling, and will not have computer access, this is so helpful to keep them current in their work. My son, who used the Algebra II curriculum says that he found the ALEKS system “not as daunting as a textbook” . He was easily able to see the progress he needed to make to master a certain area of study with his pie chart. He also added that he felt like the program was very individualized. He liked that he could work at his own pace, and change courses at anytime. If he had mastered all of Algebra II he could move on, and not have to wait until the next textbook arrived. He has asked to continue with the ALEKS Math system. My daughter who used the Algebra curriculum echoed her brother in her feelings about this system. She also has requested to continue using this program for her Math for the remainder of High School. She likes the hyperlinked text that shows how to solve problems various ways. Both of the older children, stated that even if they had a shortened amount of time to spend on Math that day, they always felt a sense of accomplishment by completing one or two topics. With a traditional textbook they felt always like they needed to complete an entire lesson, and some days, that just felt too hard. They also enjoyed the lack of repetition that the program provides. They always felt like they were moving forward. Yes, the program repeats concepts with new assessments to assure that the child has mastered the concept, but, my children really liked the fact that 80% of their learning was NEW information, and not repeating the lesson before. For children in the lower grades, I recommend that they practice their keyboarding and number pad skills, prior to using Quick Tables. My youngest never got past entering random numbers in as his skill. The program must require they meet a certain speed before they can enter the answer to math problems. Even though that was what he was given every time he wanted to play, he still enjoyed it very much and always wanted to do Quick Tables. ALEKS is a subscription based program. You can pay monthly for $19.95 per child. You can pay for 6 months, at $99.95. A year subscription is $179.95, for one child. They do offer a family discount, and for my two high schoolers it would be $305.90 for a year, a 36% savings. To see how much your family can save click here. In comparison, ALEKS would save me about $5 per child over the math curriculum that we currently use, and with a family discount, it would save me $32 per child, a more substantial savings! Please take the time to use their 30 day free trial. Test it out with your children and see if it is a fit for your family. Other members of the TOS Homeschool Crew reviewed this product, click here to see how it worked for them.